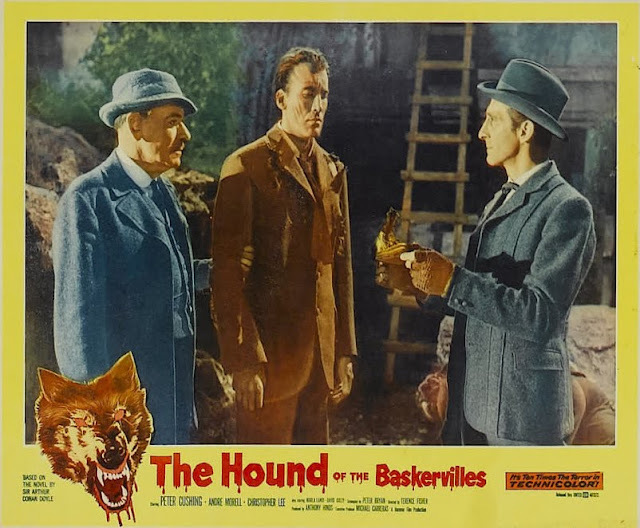 To watch Hammer’s 1959 Hound Of The Baskervilles twice within days made me ponder reasons for going back when so many interesting things remain unwatched. I think it’s mostly the welcoming house and grounds at Bray, which is odd for the fact they’re 4000 miles off and I’ve never once visited except in US theatres and more lately DVD. Still, there’s familiarity in those environs that’s just like coming home. Bray was the place where Hammer operated, shot their movies, and served meals. Every room, corner, and shed turned up eventually as background or was dressed for a set. I like going on Hammer holidays, exploring upstairs and down in castles (really just one) that designer Bernard Robinson modified time and again to suit purposes of whatever monster claimed residence. Every crypt and fireplace is like the handshake of an old friend. Those who wonder at the allure of Hammer just haven’t seen enough of it. Their films have a better sense of community than output from any other company. Personnel who spent careers there have confirmed as much. A comforting and familial place it was. Where else do horror films give off such a warm glow? There’s toasty rooms where you can sit before a crackling hearth like Jonathon Harker to enjoy your host’s wine and a baked loaf, then retire upstairs where bed chambers maintain crispness of Autumn air. We see their breath when John Van Eyssen and Christopher Lee speak in Horror Of Dracula, a reality of chilly Bray stages I’d not trade for anything. The Little Shoppe Of Horrors is a terrific magazine devoted to Hammer Films. They’ve published photos of Bray both inside and out that show just how economical those settings were. How they managed to make them look so majestic in finished product is tribute to genius and ingenuity of artists on staff. Surely Bray was a magical place when Hammer thrived there, for seeing films they made, especially when properly presented, is like bed and breakfast at --- take your pick --- Castle Dracula, Frankenstein’s chateau, or Baskerville Hall. No wonder I keep going back. MGM’s High-Definition network has been running Hound Of The Baskervilles. I wonder if they realize what joy they’ve given fans who’ve waited years to see it so gloriously rendered. The DVD was a bust for being non-anamorphic. Prior to that was television’s ritual abuse. Hound was not the world-beater Hammer and United Artists counted on when released in Summer 1959. There was $450,000 in domestic rentals, a figure cleaved by half of what Universal-International realized off the previous year’s school vacation release of Horror Of Dracula. The novelty of Hammer was wearing off even as quality maintained. Hound had to compete with another from the company that Paramount was handling, The Man Who Could Cheat Death, which drew a punier $238,000 in domestic rentals. Hound did much better in foreign markets, with rentals from those territories coming to an impressive $1.4 million, so it was by no means a failure overall. Chinks in armor of its US campaign might be spotted in awkward effort to sell Hound as a blood-dripping horror fest along lines of prior hits Curse Of Frankenstein and Horror Of Dracula. Totally ignored in all ads was the fact that this was a Sherlock Holmes mystery. Of what commercial value was Conan Doyle’s character in an exploitation-driven late-50’s market? 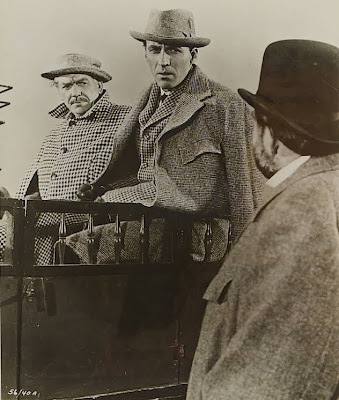 Holmes hadn’t been around since infrequently revived Basil Rathbone thrillers, which by the mid-fifties were being shown on television. 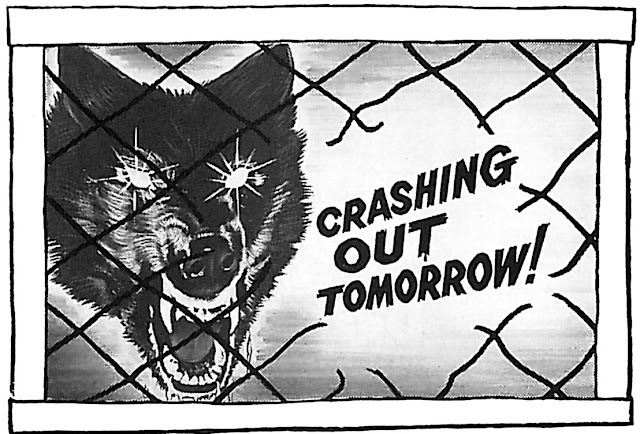 The big push for 1959’s Hound focused on the title beast, made to look so ferocious as to imply a werewolf’s not-so-distant cousin. What Hammer put on the screen was a distinct letdown from that, and I wonder if disappointed word-of-mouth among kid patrons did damage to second/third days and subsequent runs (anyone recall their initial impression?). Something about a Bone Chilling Howl made ad copy for most engagements, perhaps not enough to close sufficient sales. Still, there were showmen who persevered. One was Dan Austell of Winston-Salem’s Carolina Theatre. He utilized the deathless wheeze of inducing a local woman to sit alone in his auditorium for a midnight showing of Hound, a fresh ten-dollar bill her reward for making it through the show (WANTED! 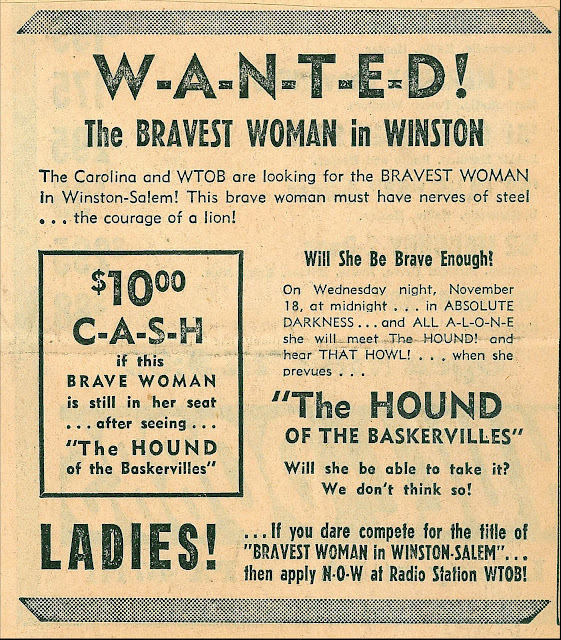 --- The Bravest Woman In Winston). WTOB was King of the Hill among local AM Top 40 stations and often tied in with theatres for stunts like this. The Carolina shared first-run product with the Winston, located just down a block. Neither gravitated to horror films as a rule, and runs were brief when they did (I remember Masque Of The Red Death being in and out of the Carolina after two days, contrary to their usual three-or-more policy for new pics). United Artists must have sent up a crack salesman to get a mid-week booking and such aggressive campaigning on Hound’s behalf. The Thalhimers referred to in the ad was Winston-Salem’s ritziest department store, located across the street and more or less between the Carolina and the Winston. I was bored silly the few times my mother took me in there. They did indeed have a beauty salon on the third floor. The women wore uniforms just like Mrs. Maxine (Bare) Morrison’s here and looked like nurses. It’s sobering to think that this young woman in her undoubted twenties is now at least to mid-seventies. 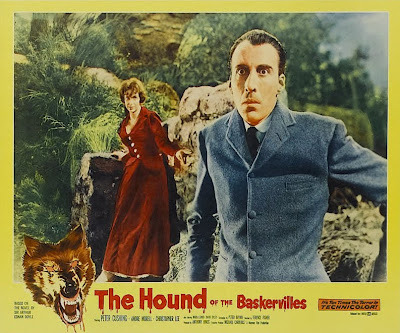 I wish I could talk with Mrs. Morrison, for I’ll bet if she’s still among us, she’d well remember that midnight show of Hound Of The Baskervilles at the Carolina (well, wouldn’t you?). 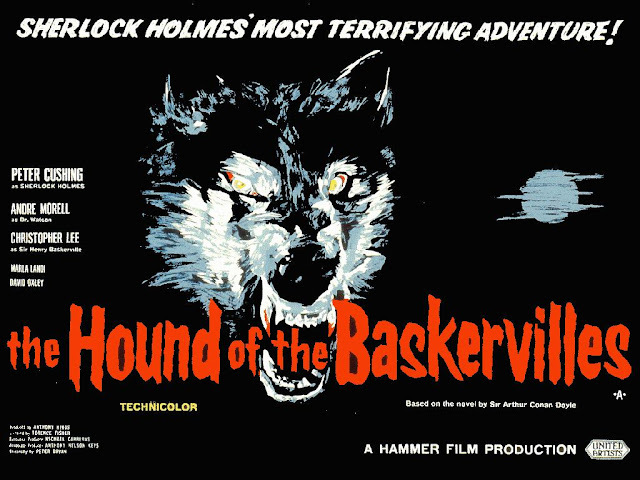 Many of the Hammer films owned or partly so by Seven Arts were kept off television until the seventies and thus enjoyed extended lives on theatre screens, while others, like Hound Of The Baskervilles, shuttled off to the tube much earlier. 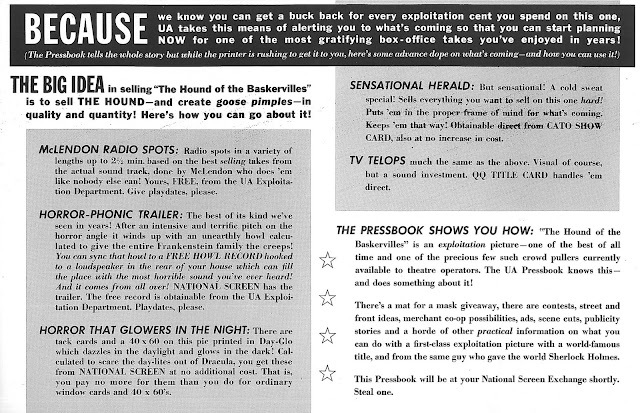 Hound’s syndicated availability was announced in July 1962 as part of a thirty-one title package including UA features just off ABC network runs. Being the lone horror film in the group (other than sci-fi chiller, Invisible Invaders), Hound would share late-night berths with highly regarded Witness For The Prosecution, Sweet Smell Of Success, and others. 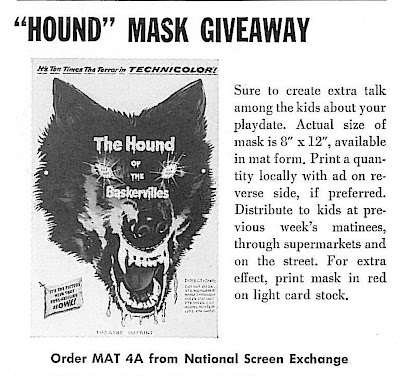 The following 1963-64 season saw Hound joining a group of sixty UA/RKO/pre-48 horrors in a syndicated package that was probably the best one available outside of Screen Gems’ two Universal "Shock" groups, as it boasted Doctor X, the Val Lewtons, King Kong, and many more favorites. 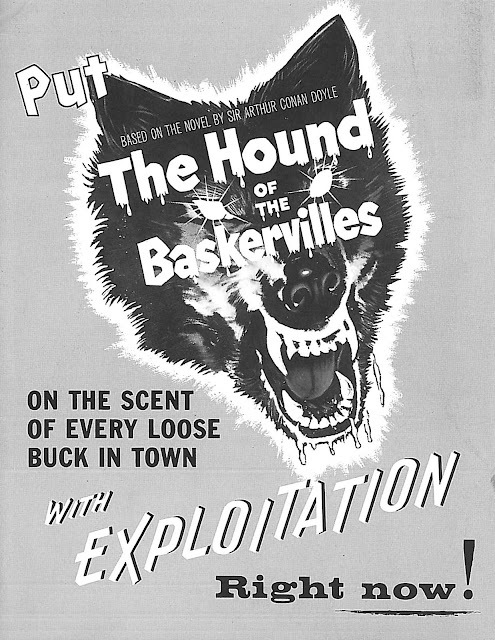 There’d been talk of Hammer launching a series of Sherlock Holmes thrillers beginning with Hound Of The Baskervilles. UK audiences might well have embraced it (note the above British quad’s reference to S.H. 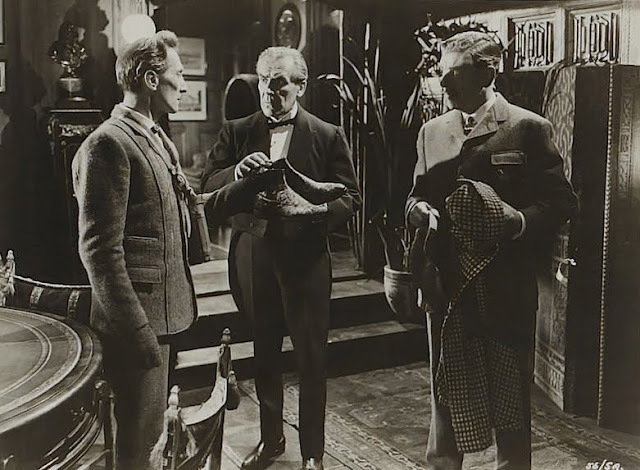 ), but United Artists’ domestic sales force had no such confidence in the Holmes name as potential draw. The film itself juiced up creepy elements not to be found in Doyle’s source novel. Hammer had its own brand name and reputation to uphold. There’s flamboyance here to erase memories of staid sleuthing done by previous Holmes enactors. Peter Cushing’s exuberance freshens up plot machinations less energetic during a long middle section when he’s offscreen, and Christopher Lee enjoys the sort of dashingly romantic part I wish he’d played more often. As with so many Hammers, color is a Godsend. Theirs had a look peculiar to British Technicolor processing that upped tension levels in ways almost subliminal. Ones I saw theatrically are memory stored yet as unique encountering with reds, greens, and blues rendered like nowhere in US chillers, which beside Hammer output, always seemed more conventional. Martin Scorsese once recalled that Hammer films were events growing up, chillers he and friends knew as something special. The best of Hammer made Anglophiles of a generation of American youth, well before James Bond and the Beatles took credit for leading Britian’s cultural invasion. Hammah Horrah don't skeer me! Kilgore wasn't so far fetched. Casting Cagney as The Creature wouldn't be as silly as De Niro or Christopher Lee. You're darn tootin' I remember my initial impression of Hound (I was 11 in 1959), and all I can say is there wasn't any disappointed word-of-my-mouth to cut into the box office at the Stamm Theatre in Antioch, CA. Nor of any of the mouths in my circle, for that matter. That movie set me to reading Conan Doyle in earnest, too. The last sentence of your post is a stunning insight, John. 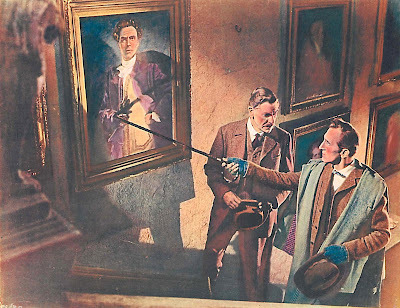 I'd never thought about it before, but you're right: boys like us first had our eyes turned Across the Pond by Hammer, Peter Cushing and Christopher Lee. I'd add only that the Beatles brought along the girls, and James Bond, the grownups. Rich Finegan's postcard photo of ON THE NIGHT STAGE is appropriate for Greenbriar, because it's a reissue promotion. Although the film dates from 1915, the card is from the 1923-24 season. Tri-Stone Pictures was really Harry Aitken, who had been involved in bringing Mack Sennett and Thomas Ince into the Triangle partnership of 1916. Aitken still had negatives of many early Keystone and Ince shorts, and reprinted them under the Tri-Stone states-rights banner. They once did a special tribute to W.C. Fields at the Academy. The Post Office was issuing a special stamp in his honor, I think. It was an evening of great, hilarious film clips and many people who had worked with Bill and were still alive. Ed McMahon was the Master of Ceremonies. Sitting exactly in front of me were Christopher Lee and Chuck McCann, laughing their heads off like two overgrown kids! Thanks for that info on the Bill Hart reissue, Scott. RJ, I should have been sitting beside you at the Fields show that night. As for Chris, I hear he's a big fan of Tom and Jerry cartoons as well. Christopher, between you and RJ, I'm beginning to realize that Chris Lee is a real comedy man. All the more reason to like him.